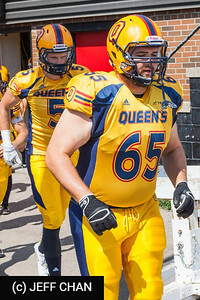 Photos of the Queen's Golden Gaels vs. the York Lions at Centennial Park Stadium, Toronto, ON on August 25, 2013. 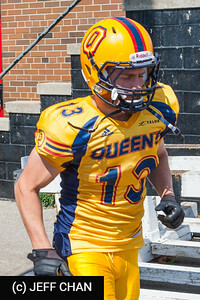 The Queen's Gaels (1-0) opened their 2013 season with a 52-1 victory over the York Lions at Centennial Park Stadium in Etobicoke on Sunday afternoon. 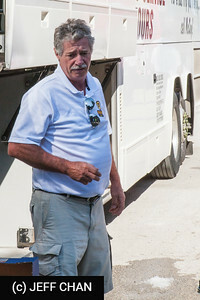 Giovanni Aprile (Scarborough, Ont.) got the Gaels started early in the first quarter with both rushing and receiving touchdowns. Queen's never looked back from that point on and Aprile finished the day with four touchdowns, 176 yards receiving, 26 yards rushing and 147 total return yards. Gaels receiver Giovanni Aprile finished with four touchdowns in a game for the second time in his career. The Gaels scored 36 points in the first half, in large part to Aprile who scored on the ground through the air twice and via a 115 yard return on the day, without giving up any points to take a commanding 36-0 lead at half. 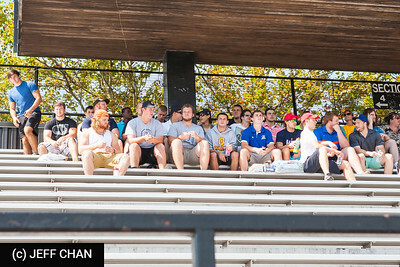 Gaels starting quarterback Billy McPhee (Burlington, Ont.) connected with Aprile for both of his touchdown passes on the day and finishing with 311 yards passing. "I'm pretty happy with how the day went, obviously we left a few points on the table," said Gaels head coach Pat Sheahan after the game. "Overall a good first start, we had a lot of guys make a lot of good contributions so it was really a good team effort." "Aprile was outstanding it's not too much of a stretch to say he could have had six touchdowns today. We could tell when he caught it (missed field goal) he was going to go a long way and he just outlegged everyone when he secured it." 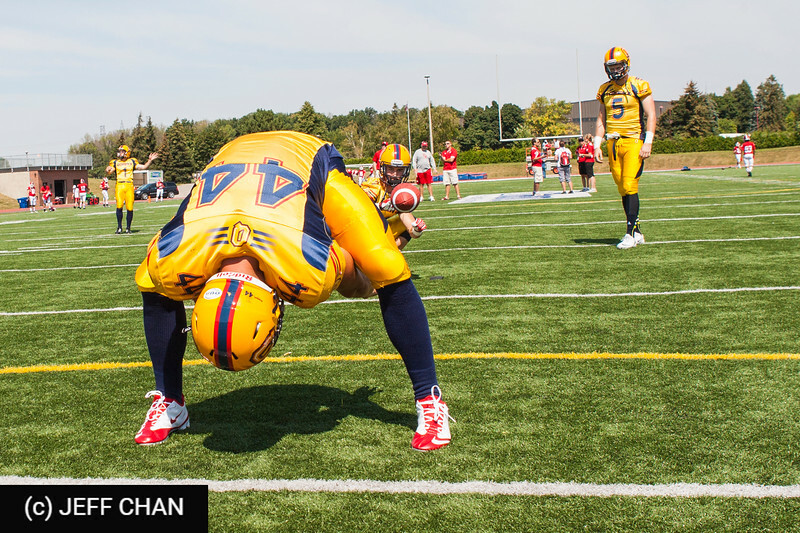 The Lions were led by Jason Charland (Quebec City) who finished with three catches and 42 yards receiving. York scored their lone point after a missed field goal went through the back on the endzone. 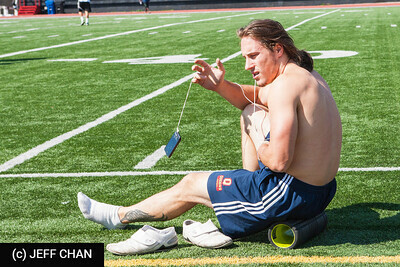 Gaels freshman running back Jonah Pataki (Wallaceburg, Ont.) 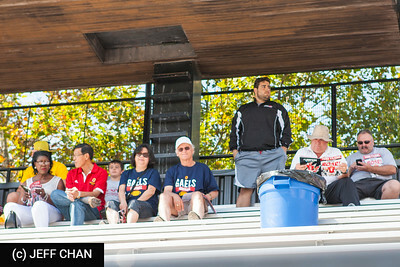 contributed with his first career CIS touchdown, a one yard run to put the Gaels up 46-1 in the third quarter. 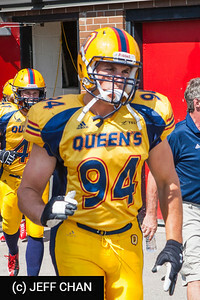 On the defensive side of the Ball Queen's was led by 2012 CIS first-team All-Canadian T.J. Chase-Dunawa (Toronto) who finished with five tackles and an interception that he returned 34 yards. The Lions got strong production from James Tuck (Aurora, Ont.) who nabbed 4.5 tackles, 1.5 tackles for a loss and two breakups. 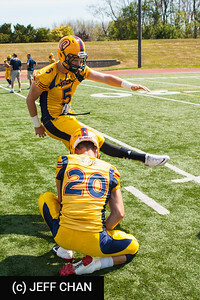 Gaels second-year kicker Dillon Wamsley (London, Ont.) had a strong day for Queen's hitting five of six field goals with his long coming from 43 yards out. 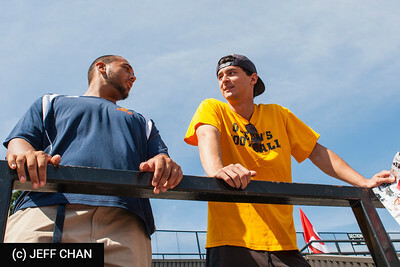 It was the second time Aprile has scored four touchdowns in a game, repeating a feat he had previously accomplished against the Laurier Golden Hawks on September 17, 2011. Aprile missed out on the Gaels all-time record for points in a game by two (Connie Mandala 26 vs. Concordia, Oct. 18th, 1986). With the win the Gaels now improve to 16-0 all-time against York. 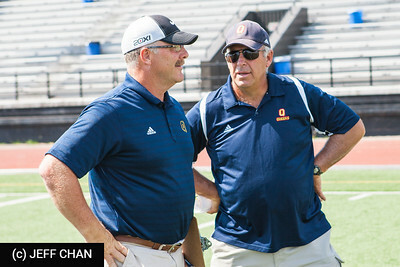 Giovanni Aprile scored four touchdowns — and narrowly missed two others — as the Queen’s Golden Gaels opened the Ontario University Athletics football season Sunday with a 52-1 win over the York Lions at Centennial Stadium. 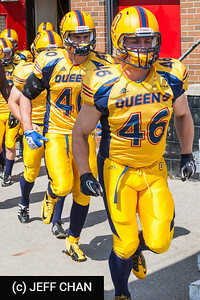 Aprile scored Queen’s first touchdown on an end-around in the game’s eighth minute and seven minutes later he completed a 58-yard pass play with Billy McPhee for his second major of the game. The two connected on a 55-yard TD pass two minutes into the third quarter and before the half ended Aprile caught a missed York field goal attempt and took it 115 yards for his fourth TD of the game. In between, McPhee and Aprile connected on a play down the left sideline that went 59 yards before Aprile, trying to keep his balance as he dodged York’s last defender, stepped on the sideline at the York 12-yard line. Early in the third quarter Aprile was open in the end zone but teammate Scott MacDonell didn’t know he was there. MacDonell reached for the ball in front of Aprile and knocked it away, almost making a fingertip catch himself. Aprile finished the game with 176 yards receiving and 349 total yards. 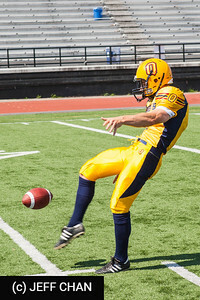 Dillon Wamsley kicked five field goals and five converts. 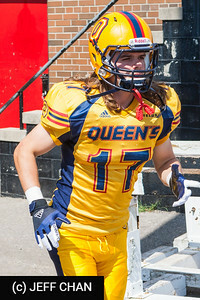 Queen’s got its other touchdown from freshman running back Jonah Pataki on a one-yard carry in the third quarter. 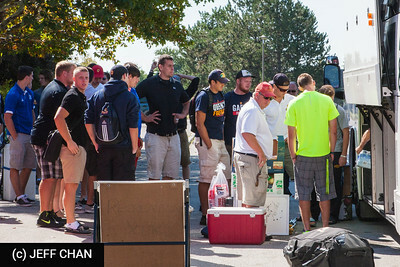 For the Gaels it was the 16th consecutive victory over York, which has never beaten Queen’s in the school’s history. 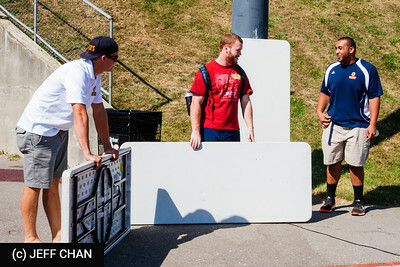 Fourth-year receiver Giovanni Aprile scored four first-half touchdowns to lead the Queen's University Gaels to a 52-1 victory over the York University Lions in the season opener for both teams at Centennial Park Stadium on Sunday (Aug. 25). Aprile's most electric score was a missed field goal that he returned 115 yards the other way to make the score 36-0 in favour of the Gaels. The Scarborough, Ont., native also recorded the first points of the game on a 26-yard rush and tallied a pair of long touchdowns in the air, the first for 58 yards late in the first quarter and the second for 55 yards at the beginning of the second. For the game, he recorded 349 all-purpose yards, accounting for 176 receiving yards, 122 return yards and 26 rushing yards. The Gaels, contenders to win the Yates Cup this year with veteran players at nearly every position on the field, went the first seven minutes of the game without a score as both teams traded punts, but Queen's quickly got on the board and didn't look back from there. 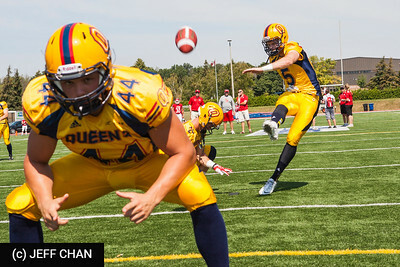 The Lions outgained the Gaels on the ground – 120 yards to 96 – but Queen's broke the game open with a series of big plays in the air, which proved to be the difference. 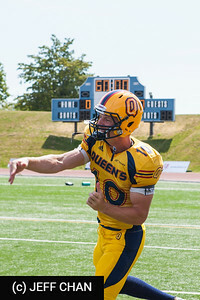 Quarterback Billy McPhee (Burlington, Ont.) completed 13-of-23 passes for 311 yards and two touchdowns, while his counterpart, York's Myles Gibbon (Montreal) went 10-for-19 for 100 yards and an interception. Gibbon also accounted for 45 yards on 15 carries on the ground, the most of any player in the game. On defence the Lions were led by fourth-year defensive end James Tuck (Aurora, Ont.) 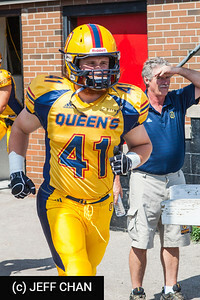 and fourth-year defensive back Cory Bellerdine (Orleans, Ont. ), who both had 4.5 tackles. Tuck was all over the field, recording one huge nine-yard tackle for loss and a big pass break-up when he knocked the ball down at the line of scrimmage. 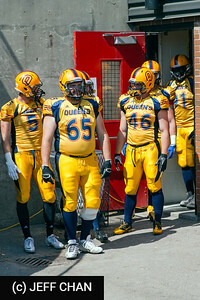 The Gaels' defensive leaders were T.J. Chase Dunawa (Toronto) and Cory Dyer (Gananoque, Ont. ), who had five tackles each.